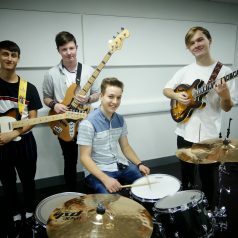 Callum Minks (18), Amias Burrows (19), Alex Plater (18) and George Gray (17), also known as Indigo Bay, are all Level 3 Music Practioner learners, in their second year. The foursome were originally put in separate bands after starting college, however linked up in February this year after discovering a mutual love of artists such as the Beatles. “We met on the course; we were put in separate bands originally but just started getting together and playing songs we liked,” they said. “We started off with just Alex and Callum playing Beatles covers but we needed a drummer, then a bassist, so got the others in. One of the artists they started off covering was Mac DeMarco and, after scoring a charity gig just two weeks after first forming, they played two of his songs. The band, which “moves around the indie genre”, released a single called Robin on October 5th, and has since played a number of gigs at venues around town. They also performed at the Christmas light switch-on in Grimsby town centre last week. “We’ve had a good reception and are increasing our following on social media. As soon as the single went out we put an advert out and reached 7,000 people. “Our two main goals are to build up our social media following and finish recording our EP. We also want to continue gigging and maybe do a little tour. The group of learners are at college “nearly every day”, and praised their course for “giving us a facility to be able to do this”. “Recording studios are really expensive so it’s great being here and being able to use the college facilities. “The course has a really good approach because you can do a bit of everything. It feels more like a family; the tutors are your best mates. Alex added: “I’d never played for anyone apart from my mum and dad, and even then I was shaking. I had only played in my bedroom, so have come on miles since starting the course. The band are on Facebook, Twitter and Instagram as @theindigobay. Their music is available on streaming sites, iTunes and YouTube.